March 23, 2010 - - - Washington D.C. ---What do you get when you take some of the world's greatest streetball players, pair them with one of the world's greatest entertainers and combine it with one of the world's greatest sporting events? A slam dunk that's sure to make history! The Street Basketball Association along with SBA Sports and Entertainment is proud to announce that the SBA has been contracted to choreograph and perform a free-style dribbling and slam dunking routine for a promotional basketball music video featuring the SBA All-Stars, Sean "Diddy" Combs, and his new group DIDDY-DIRTY MONEY. No one puts on a show like the SBA! The video premiered as the teaser, highlighted right before the NCAA Final Four Tournament Championship Game and then replayed right before the 2nd half of the final game of another amazing March Madness. SBA All-Stars Pat Da-Roc, White Chocolate, Future, and Trikz will perform some amazing new free-style moves while DIDDY-DIRTY MONEY featuring Diddy sing and dance to the latest track from their upcoming album Last Train To Paris scheduled to be released June 22nd, 2010. In the backdrop SBA All-Stars MR. Africa, Airborne, and JFK are catching alley-oups and throwing down some thunderous, rim-rocking dunks. "This is a great look for us (SBA All-Stars)," states Luis Da Silva, aka Trikz, "We will be exposed to the millions of fans who tune in to watch the Championship game. 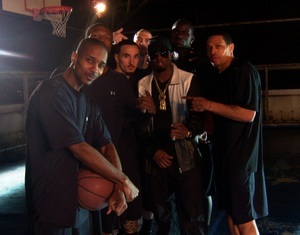 This was one of the most high profile shoots I have been on since the Nike Free-style commercial." Speaking of talent, The SBA All-Stars shot the video on location last week in the Big Apple at a very unique site; a street basketball court that's perched on the penthouse/top level of a historic building in NYC overlooking Central Park. The video which was shot at night under the bright lights features cutting edge cinematography in pure Diddy style. "It was good to be back with Diddy to support the release of his new group," states Malloy Nesmith, aka Future, who won an EBC Championship for Diddy's Bad Boy team a few years ago at RuckerPark. WE GOT OUR FIVE, GET YOURS!